BIOS's Ocean Academy director and camp instructor Kaitlin Noyes (center) helped students with an investigation into the feeding habits of a local marine invertebrate called the zebra nudibranch. The new camp program was designed for students ages 12 to 15 who are interested in the ocean but lacked previous experience studying marine science. 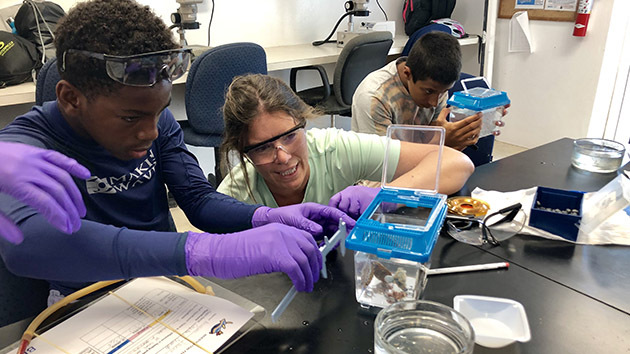 A new BIOS summer program offered local students ages 12 to 15 an introduction to Bermuda’s marine environment and provided a strong foundation in scientific research, both in the laboratory and the field. Institute education staff developed the Ocean Science Camp to appeal to students who are interested in oceanography but lack previous marine science experience. KPMG and Bermuda Skyport Corporation Ltd. provided bursaries for this year’s camp. “Our goal was to provide students with collaborative experiences that allowed for exploration and idea-generation, while also improving their confidence and inspiring a respect for the marine environment,” said Kaitlin Noyes, director of BIOS’s Ocean Academy. To achieve these goals, each of the five days involved a scientific investigation that required students to develop a hypothesis, plan an experimental design, collect marine organisms in the field, and provide ongoing care of these organisms during the study period. The first experiment was an investigation into the feeding preferences of the zebra nudibranch, a local marine invertebrate also called a “sea slug.” Using both the classroom and the wet-bench facility on the BIOS waterfront, students set up aquarium tanks with nudibranchs and three species of local marine sponges. Each morning, they recorded the weight of the sponges to determine how much sponge material the nudibranchs consumed overnight. After four days of observation and data collection, the students reported the nudibranchs preferred one species of sponge—the blue or ethereal sponge—over the other two. The second investigation focused on a local group of crustaceans called decorator crabs. These unique marine organisms use their pincer-like claws to remove small pieces of sponge and algae, which they attach to their shells for camouflage. Students placed two species of decorator crabs in the aquarium tanks along with various materials collected from Ferry Reach. After three days of observation and a day of data analysis, the students found that one species of crab—which was orange-red in color—preferred fire sponge as a camouflage material, while the other species—which was darker in color—preferred green algae. Midway through the week-long camp, students and instructors kayaked and snorkeled at Coney Island in search of seagrass beds. The BIOS science camp provided students with opportunities to learn and practice laboratory-based science investigation skills as well as daily field excursions, giving participants hands-on experience in Bermuda’s marine and coastal habitats. 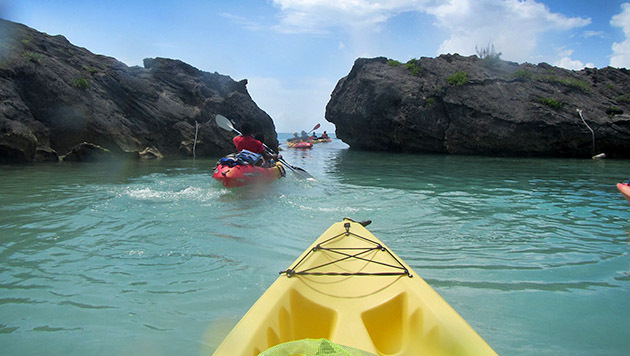 Following these investigations, students spent afternoons on field excursions to practice snorkeling skills, explore Bermuda’s coastal and marine environments, and take part in fish and coral identification activities. These daily outings took them along Ferry Reach by kayak to the Coney Island seagrass beds on the northeastern portion of the island, and by boat to Harrington Sound, as well as to the wreck of the Sea Fern in St. George’s Harbor. On the last day of the camp, students had an introduction to SCUBA diving and practiced basic SCUBA skills in the protected waters of Whalebone Bay. Phoebe Barboza, a veteran of BIOS education programs including Waterstart, Marine Science Internship, and the Bermuda Program, brought her experiences full circle by working as an instructor for Ocean Science Camp. Dellwood Middle School student Kristian Cherrington showed his enthusiasm by arriving at camp early each morning to start on the day’s scientific experiments. “Science is one of my favorite classes at school and attending the Ocean Science Camp triggered my interest in pursuing a career in marine science,” Cherrington said. Based on his experience this summer, camp instructors recommended that he attend Waterstart, BIOS’s community partner, to become SCUBA certified, which will bring him one step closer to a possible future career in the field. In their camp evaluations, a majority of students expressed increased knowledge of local marine species and habitats, as well as various scientific methods and tools. All students reported a stronger connection to the ocean after attending camp.